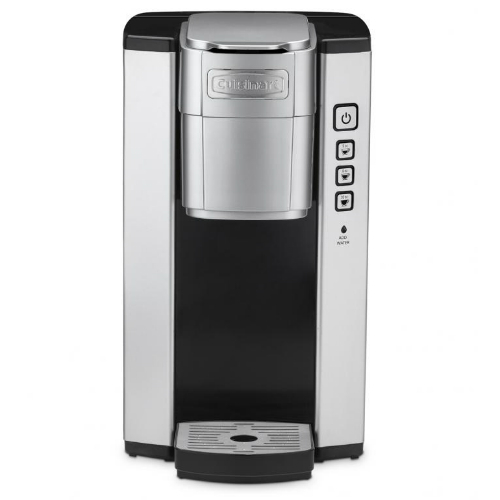 The Cuisinart SS-5 is a single serve home-brewing system which is perfect for both personal use and entertaining. The brewing system makes coffee or tea under one minute. This brewer’s Push button control makes consumers easier to enjoy a for 3 beverage sizes: 6, 8, 10 oz. The system has a Charcoal water filter. The machine has 30-minute auto shut off that makes morning departures stress free. It features a 40 oz. water reservoir and three serving size options with removable drip tray that accommodates travel mugs. 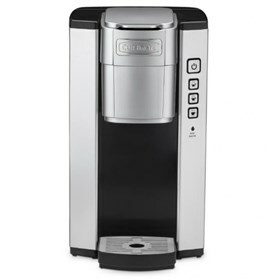 The Cuisinart Single Serve Brewer has many exciting features for users of all types. You can extend the lifetime of your Cuisinart Single Serve Brewer with the purchase of a FactoryOutletStore Factory Protection Plan. The Cuisinart Single Serve Brewer is sold as a Brand New Unopened Item.